Several states have legalized marijuana—typically referred to as cannabis when prescribed by a doctor—for medical use, including for treating psychiatric conditions. However, medical marijuana use is still controversial, and the law on cannabis use for patients is murky. Cannabis is not treated like other drugs; doctors don’t prescribe specific dosages or strains, and dosing is largely left up to patients. Thus, cannabis is in a gray zone and seems destined to remain there for quite some time. Medical marijuana can treat a number of conditions in some patients. For example, symptoms of anxiety and posttraumatic stress (PTSD) have been reported to respond to treatment with cannabis. Many patients state that, after a few weeks of cannabis use, they continue to feel relaxed even when they are no longer high. Cannabis is also effective in treating chronic pain conditions, which means it might work with some somatic conditions. While some people with depression use cannabis to control their mood, others report that it makes them feel more depressed, so the benefits of marijuana to those who have depression are not entirely clear. For patients who have dealt with the side effects of traditional psychoactive drugs, cannabis can provide a welcome respite. Most people report fewer side effects than with traditional drugs, although cannabis does interfere with reaction time and short-term memory. 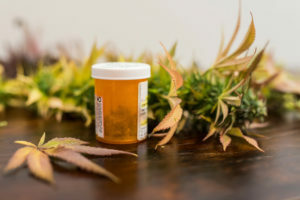 For many patients with a mental illness, the side effects of psychoactive drugs can be unbearable, so the generally lower side effects of cannabis offer a meaningful alternative that may encourage patients to continue with medical care. Cannabis is also safer than many other psychoactive drugs. The lethal dose of cannabis is so high that no person would reasonably be able to consume that much marijuana, making it an ideal choice for people who have suicidal thoughts are behaviors and are at risk of overdose. Some psychiatric conditions are not well served by traditional drugs. Patients with PTSD, for example, may find that selective serotonin reuptake inhibitors and antianxiety medications do little to blunt their intrusive thoughts and flashbacks. When patients have tried and failed with numerous drugs, cannabis can feel like a miracle. Many proponents of medical marijuana argue that, because cannabis is a naturally occurring substance, it carries fewer risks than chemically processed drugs. Others have pointed out that cannabis use has been a part of human existence for centuries, and it may help some health problems in addition to alleviating mental health concerns. The most significant risk posed by cannabis is that, unlike many other medications, there are no recommended dosing requirements. 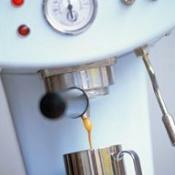 Thus patients have to experiment with dosing, method of administration, and strain. The result may be a patient who has to go through several weeks feeling high or lethargic before she gets relief. There has been significant debate about the addictive nature of cannabis. Because cannabis is illegal in most areas of the United States, it is extremely difficult to obtain accurate information about how addictive the substance is. However, some patients report a strong psychological addiction to the substance, and a few may become chemically dependent. 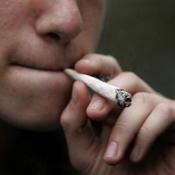 Smoked cannabis poses a risk of lung cancer and other respiratory problems. In individuals with schizophrenia, cannabis may induce psychotic episodes. In very young patients, cannabis can also cause psychosis, stunted growth, and other health problems. Teenagers and children should not use medical marijuana unless directed to do so by a doctor. The District of Columbia and 17 states currently have medical marijuana laws. However, even in states where medical marijuana is permissible, its legal status is foggy at best. The federal government has raided marijuana dispensaries and sentenced dispensary owners to long federal prison sentences. Frequently, these dispensary owners are prohibited from using the fact that the drug is legal in their state to defend themselves. Thus the most significant risk of medical marijuana may be its legal status. The United States government still lists marijuana as a Schedule I drug with no acceptable medical use and no safe dosage. This classification is widely considered to be incorrect and misleading, but until marijuana is removed from Schedule I classification, using it poses significant legal risks to patients. Earleywine, M. (2005). Understanding marijuana: A new look at the scientific evidence. New York, NY: Oxford University Press. If the medical use of marijuana was something suggested by my doctor for either me or for a family member I would have to have a serious talk with her regarding whether the benefits do outweight the risks. Since there is not legal outline for what a doage should be then I have some concerns about that. Also I am worried that I would be trading one problem for another, maybe my appetite gets better but do I end up with a substance abuse addiction? I seriously hope that these and other issues are being considered by both doctors and patients before jumping into this kind of therapy and treatment, that they are weighing the benefits against the risk and making an informed and educated decision. I’m all for medical marijuana. The benefits from it far outweigh the risk it poses,if any. And with regard to ill effects due to cannabis being smoked there are always other methods of administration, like edibles and vaporizers. But in the end it is illegal and as you have rightly pointed it, that is the biggest danger in cannabis. Its illegality! never gonna be easy to think of cannabis as a medicine for many people.reason?all the brainwashing that has been going on for the past several decades.I think the entire war on drugs is a complete waste.we want people and policies to be efficient.yet we do not practice it-things like the war on drugs and war on terror(which is nothing different,just different targets) are bottomless pits where taxpayers money is guzzled down without a thought and something that benefits a very few.why is it so hard to see this? Marijuana has been around forever, so I think that by now if there were that many harmful risks associated with it then there would not be so many physicians who recommend it for their patients. the for and against of this topic can and will go on forever.so I think the best way forward is for the government to decriminalize it (not legalize) and stop meddling with the dispensaries in States where it has already been decriminalized. Making this legal for the public is not the answer. People mistanly think that marijuana is not addictive but it isn’t. I think that there is a small minority of patients who MAY benefit, but surely in this world of advancing medical knowledge, thete is another drug available without the addictive ramifications that could be used instead? Personally I think that those people who are all about making pot legal are people who just wish to rock the boat, but maybe for all the wrong reasons. Do you have any idea how many of those medications are addictive?? Most of those pills are far worse and could have far worse side effects than a natural plant. Yes, there are some cons, but what medication doesn’t have them? As someone who’s struggled with mental illness my entire life and have researched MANY different medications used to treat mental illness, not a damn one was more effective than marijuana. I promise. I’m incomfortable with the side effects of the medications I’m on. Increased risk in suicidal thoughts, intense episodes of rage, increased anxiety, drowsiness, ect. I wish the state I lived in included mental illness in the ilnesses they cover for marijuana so I could partake and get some relief. Look at your cough syrup bottle. I bet you find worse side effects than for marijuana. @laura: there are benefits and there are drawbacks..but its not the same story for everybody..its different for different people. and although there are surely more people wanting to use it for recreational purposes than people who need it medically, who are we to stop them? what right does the government or anybody else have to stop these people from putting something into their bodies? would you like to be termed a criminal because you choose to use cosmetics?there are benefits(only aesthetic) and drawbacks to cosmetics too.how would you feel if the government or other people told you if you could or could not use cosmetics? Cannabis? That’s evil and kills your brain cells…its even pushed so many people to kill themselves and is such a dangerous drug…NOT!! wow bluntinhand, hope that you are keeping your drug use a little more off the grid than what you advertised here! Any Chemical based medicine required to pass for certain test both Lab and animal before trial happen on Humans. Instead of just banning an item just without proper study, is not justified. Government should allow a controlled, study and based on that study regulated dosage in proper form of administration should be allowed. – Regulation which happens for others the same can happen. If silidanfil is allowed with study even this can also be done. Marijuana is being prescribed for mental disorders like anxiety, but also has reports of users experiencing increased anxiety after using it. Kind of odd. Check out strain review sites like wikileaf.com and you’ll see some strains with top “medical uses” citing anxiety, but then in the “negative effects” section it also cites anxiety as an adverse effect. Maybe its a similar case with adderall being prescribed for kids with ADD. If you give them speed, they calm down. Yes,i agree that cannabis is a naturally occurring substance, it carries fewer risks than chemically processed drugs.According to me take cannabis as per the doctors prescription!!! the only reason that marijuana is not legal and dispensed by all doctors is that big pharma hasn’t got their fingers in that cookie jar….You wait till big pharma starts growing it..then we’ll see how fast it is accepted as a medicine in the press and by physicians. See once the man knows he is getting your money legality is a sure thing. The Physical benefits of marijuana are far-reaching, widespread, and long-term. I’m still amazed until now how powerful the benefits of medical marijuana.